For the first time in US history, more Americans have died of drug overdoses in a single year than all those killed in the Vietnam War. The drug war has been exposed as a deadly and violent failure and the federal government shows no signs of backing down. 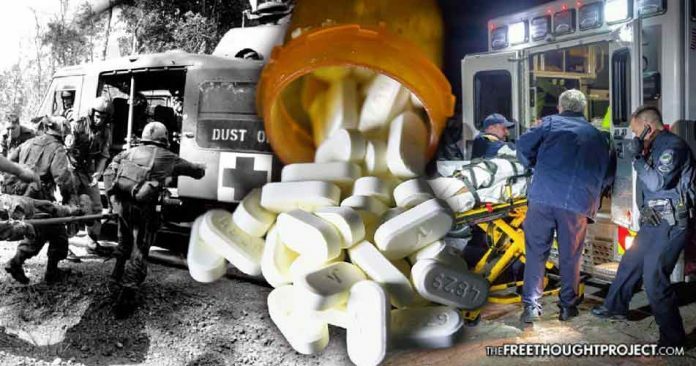 As The Free Thought Project had previously reported, drug overdose deaths outnumber the number of Americans killed in automobile accidents each year. Answering the question of who is responsible for so many overdose deaths requires a careful examination of the crisis which has now reached epidemic proportions. The principal players appear to be pharmaceutical companies, who knowingly manufacture dangerous opioids — essentially synthetic heroin — which, alone, kills tens of thousands. Big Pharma has been caught time and again pushing the pills onto the nation’s physicians who prescribe the dangerously powerful painkillers en masse — even to children. Street pushers provide the missing source for the drugs when doctors will no longer prescribe the pills to patients who have demonstrated a pattern of abuse. Yet, thanks to the war on drugs pushing the sale of these drugs into dark alleys and the like, the quality of street drugs is questionable with every dose sold. Some opiates have even been laced with the powerful drug Fentanyl, a drug so dangerous even casual contact with it can prove fatal. As TFTP reported, Insys Pharmaceuticals, the maker of Fentanyl, donated half-a-million dollars to keep marijuana from becoming legal in one U.S. state. One-third of the overdose deaths in Ohio were linked to Fentanyl, yet instead of creating a safer drug, the company was more concerned with combatting cannabis legalization. Last, but certainly not least, is the government’s own Drug Enforcement Agency (DEA). The DEA’s only purpose is propping up Big Pharma while raining hell down on Americans for their choice of substances. The DEA even admitted, early this year, it has been trafficking large quantities of controlled substances into the country. Any decision to ban opiates or remove them from the market, would likely further drive the drugs underground, increase crime, criminalize abusers, lead to growth in the prison industrial complex, and result in many more overdoses. In fact, that is exactly what’s happening. The war on drugs is creating a de facto prison state. Some U.S. States are taking matters into their own hands. As TFTP reported recently, Ohio is now suing drug manufacturers for their role in the crisis, stating their desire to increase their bottom line profit margins have crossed ethical lines and led to the deaths of countless Ohioans. Other states and police departments are also taking radical measures to fix the problem instead of prolonging and expanding it through the use of police violence. Campanello is no longer police chief there, but the program is continuing in Gloucester. The concept of helping addicts instead of criminalizing them is such a success, it’s been adopted by 200 police agencies in 28 states. This encouraging phenomenon shows that it’s possible for law enforcement to listen to reason when it comes to drug abuse and actually helping communities. Fatal overdoses and drug arrests have decreased in Gloucester. A study by Boston University and Boston Medical Center provided compelling evidence for the Angel Program’s efficacy. “In 417 cases where a person who visited the Gloucester police station was eligible for treatment, police data showed that 94.5 percent were offered direct placement and 89.7 percent enrolled in detox or other recovery services, according to Dr. Davida Schiff, a BMC pediatrician who was lead researcher in the study. Doing the opposite of the war on drugs is what truly helps people. It is also important to mention that the opiate addiction, overdose, and accidental death problems might simply be avoided if, ironically enough, marijuana is made legal nationwide. A little over half of the United States have legalized cannabis in some form, leaving nearly half of the remaining states and their residents with no access to legal weed. For now, the Department of Justice (DOJ) under the direction of Attorney Jeff Sessions and his staff, has threatened to roll back the progress cannabis activists have made in the last eight and a half years. Joining the DOJ is the DEA which refuses to reclassify cannabis, and remove its current status as a Schedule I narcotic, alongside cocaine, lsd, and heroin. All of these moves and potential moves by the DOJ and DEA will only make the problem worse unless states like Ohio take measures into their own hands. Now that many in Congress have addicted family members, children, siblings, and friends, the matter has been taken much more seriously. The idea of treating an addict with compassion instead of violence is a revolutionary notion in this country. However, in other countries, such as Portugal, its effects have been realized for more than a decade. In 2001, the Portuguese government decriminalized all drugs. 15 years later, drug use, crime, and overdoses have drastically declined in Portugal exposing the disturbing reality of prohibition. Police departments choosing compassion over kidnapping and caging people is the solution and this program’s massive adoption by hundreds of departments across the country is nothing short of bombshell. It is revolutionary, and will undoubtedly lead to progress. However, there is still a long way to go. This is how change comes — not through the barrel of a gun — but through empathy and peace.